CEO of Berner Antti Korpiniemi finished his EMBA degree at the end of the 90s, when he was working as a department director in the company. Since then, he has advanced to the helm of the entire corporation. “An EMBA is an investment that pays off”, he declares. 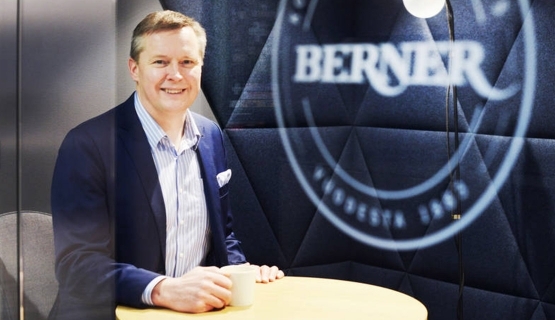 Antti Korpiniemi took to the helm of family company Berner Oy in fall 2013 when George Berner, former CEO of 25 years and great-grandson of founder Sören Berner, retired. Also, Korpiniemi had worked for the company for two decades at the time and had been a board member since 1997. Korpiniemi was still fairly inexperienced as a director when completing the EMBA program, so the studies proved useful. But what are his thoughts now: can you learn leadership in class? It is important to keep in mind that expectations towards work differ among junior and senior employees. According to Korpiniemi, millennials yearn for freedom and flexibility to build their careers but also have high expectations towards work: they are keen to influence their work and reflect on their motivation, and work needs to be meaningful and the supervisor available. Different age groups may want different things from work, yet a great deal is universal when it comes to leadership. Many of Korpiniemi’s fellow EMBA students changed jobs during or soon after the program. This is a common occurrence. An EMBA degree opens doors on the job market. Korpiniemi has stayed with the same employer and been satisfied. In his case, changing roles internally, growth, and internationalization have provided enough new challenges. As the first CEO to come from outside the Berner family, one question begs to be asked: what is it like to lead Berner as a non-Berner? In this sense, work has come naturally but is not easy by any means. Antti Korpiniemi is EMBA 1999 alumnus. This story is part of Aalto EMBA 30 years series. Other stories can be found from below. Read more about Aalto Executive MBA.